Really nice. Is this a borrow pit or did you have it built. If I get to OK can I wet a hook? It's a strip pit from the 20's and 30's. They were digging for coal. The strip pit did go for almost 6 miles past our house. Over the years land reclamation authority filled most of it in. My section is one of the last sections that was left. It ranges from as little as 7 feet to as much as 35 feet deep. Very clear and very cold. So it's perfect place for large fish to spawn. I have Huge catfish, bass, and crappie. Along with the usual blue gills and some grass carp. 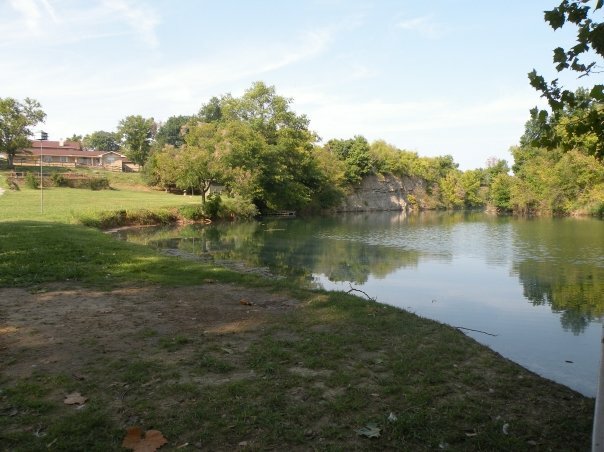 In the 50's the state had some deal going on that they wanted all former strip pits to be stocked for fishing and to help maintain a proper balance of nature. So that's how the fish ended up in it. The level never changes and the water is always cooler than you think it should be. The back section has that high cliff on the left and the other side is just as high. So when you're back there... it's super quiet. Really relaxing. I've got plenty of poles, plenty of lures, and I know all the "hot" spots. That would be fun. I love to fish stripper pits. We have a lot of them around here.